Phoenix Aikido and Fitness has been in existence since 1970, and has been in it’s present location since 1975. It was established and run by Tom and Barbara Moss until May 2003, when sadly »Tom passed away. Barbara Moss, who currently holds the rank of 6th Dan, is the principal coach of »Yama Arashi UK. Phoenix Aikido is a member of the British Aikido Board» and is affiliated to the Yama Arashi of Brussels, Belgium». Aikido is a Japanese martial art developed at the turn of the twentieth century by Morihei Ueshiba». The principal feature of Aikido is that it is completely defensive to the point of non-violence. The aggression of an attack is defeated by moving in harmony with the attacker, rendering them harmless without causing injury. 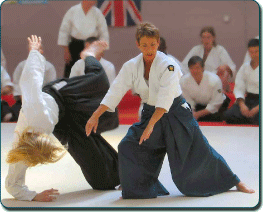 The art of Aikido is not reliant on athleticism or strength and therefore can practised by men and women of all ages. Our own dojo encompasses three separate rooms which enables us to offer a comprehensive timetable. You can see the times of our classes by looking at the »Aikido timetable and the »fitness timetable. Please feel free to stop by at the club at any time; visitors are always made welcome, no matter where you train or what grade you are.